They're too long to include in a blog post so I've posted them here. Bottom line: the reviews are largely favourable so our manuscript is provisionally accepted! The main concern of the referees is the growth issues I've written about here: the cells would not grow in the medium specified by the original authors (I had to add glutamate) and the medium I used was supplemented with 3 µM phosphate and it's basal phosphate contamination had not been measured. Of course we'll also address the comments on the manuscript posted by readers of this blog. And we'll post the complete Response to Reviewers here. 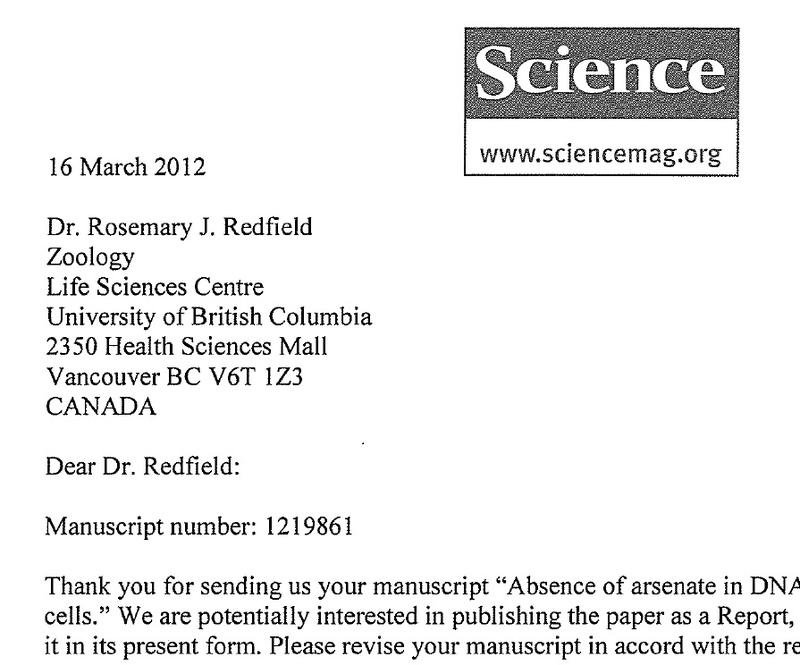 Yep - the new model of (S)science publishing. Revolutionary claims weren't justified by the data and experiments were done at least clumsily and without proper controls, but it is the skeptical scientist's follow-up story, that is rigorously reviewed and carefully checked (because: "the value of the work rests largely on the rigor of the experiments and data interpretation"). And still, poor Dr. Redfield your effort might be found futile, because YOU couldn't reproduce the GFAJ-1 growth in the original conditions (no glutamate). "Perhaps this manuscript gains weight as a way for Science to cover its backside. It seems a pity that one can sell newspapers by both committing and reporting a crime."